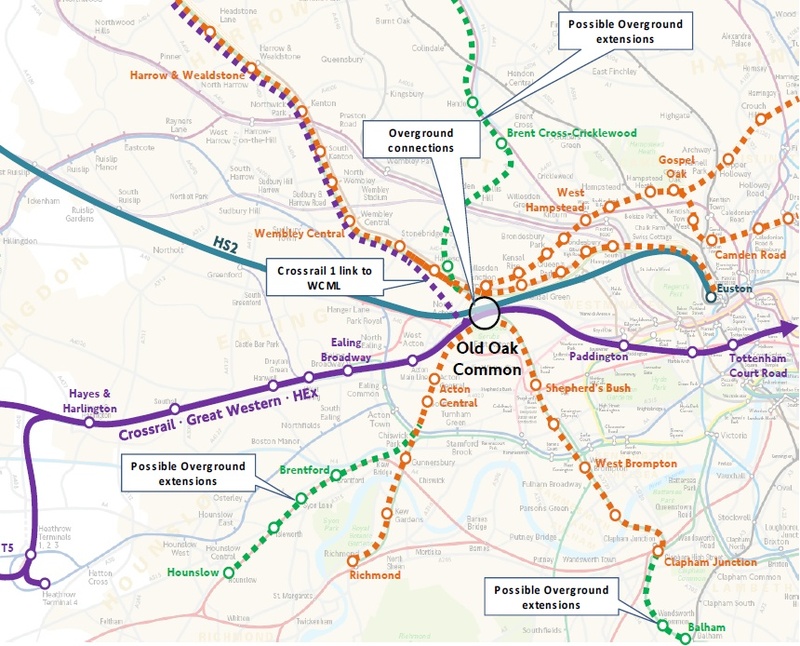 On 22nd September TfL launched a new consultation on the possibility of adding one or more stations to the London Overground in west London at Old Oak Common. With at least two other OOC rail consultations already on-going and a third due later this year on a potential Crossrail link to the West Coast Main Line (WCML), it finally seems that a new west London rail hub is moving closer to reality. In 2013, London Reconnections covered the nascent plans for Old Oak Common in some detail. We refer both newcomers and avid LR readers back to those articles to provide context but, in short, think of Old Oak Common as the Canary Wharf of west London. Old Oak Common is an emerging transport hub for HS2, Crossrail and the Overground, and the gateway to the huge Park Royal Opportunity Area. It is giving rise to one of London’s most ambitious redevelopments. Old Oak Common is expected to serve 250,000 passengers a day, which is on a par with Waterloo. Indeed the planners expect around one third of HS2 passengers to interchange at Old Oak Common for Crossrail. Adding an Overground station would take another 10%, and would also reduce the number HS2 passengers switching to Crossrail by 15%. However, the number of passengers transferring to the Overground will depend on the proximity of the platforms, the frequency of trains and the destinations served – hence the importance of identifying the optimal route and station options for the Overground at Old Oak Common. 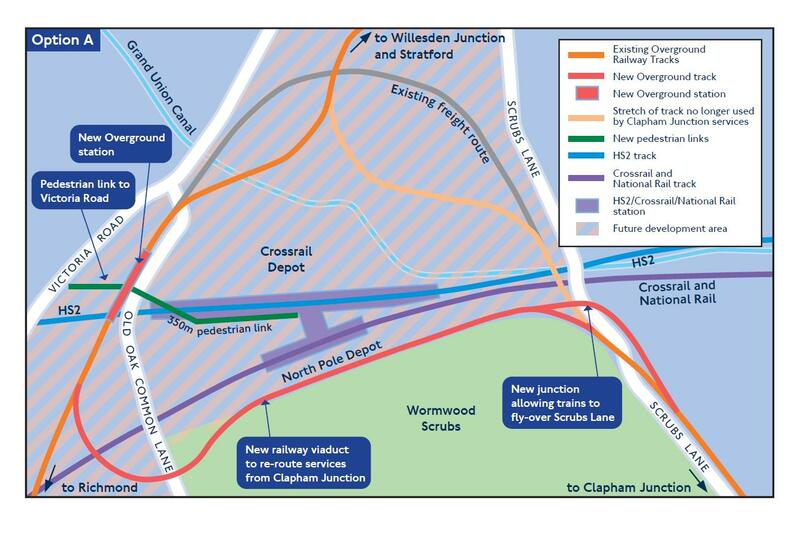 TfL’s Overground station consultation presents three options for Old Oak Common. We look at these below, in the confident expectation that LR readers will hurry hence to the TfL website, eager for the opportunity to shape the future. We recommend that you do so, because there is a vision to be forged and fragmented fiefdoms to be brought into line. That vision ultimately stretches further than the boundaries of west London, tying in with the nagging question of how can London strategically manages its growth. It’s challenging territory, but territory which we are covering in our on-going series on the Mayor’s 2050 Vision. It is fair to say however that Old Oak Common can be considered to be something of a microcosm of London as whole – part of the pattern of London breaking out of the central core, and growing though a necklace of new clusters. It also provides an intriguing test case as to how such grand, interlinked plans and visions are worked out on the ground. What is the strategic policy? How is the masterplan created? And what are the roles of the multifarious ‘stakeholders’? A year on from our articles in 2013 we now have not one, not two but three public consultations on Old Oak Common. The first of these is TfL’s Overground consultation, to be explored later, the second consultation however is from the Greater London Authority (GLA), on the proposed Mayoral Development Corporation (MDC) for Old Oak Common and Park Royal. As we reported last year, the MDC is regarded as an essential vehicle to lead on the planning and regeneration, drawing together the many stakeholders. The MDC will seek to emulate the success of the London Legacy Development Corporation that is leading the post-Olympic regeneration of Stratford and east London. Despite the opposition of key stakeholders, notably the London Borough of Hammersmith & Fulham (within which Old Oak Common largely lies), the MDC is progressing on the basis of commencing operations in April 2015. It is perhaps worth pausing briefly here to acknowledge that Old Oak Common itself can be a confusing location to mentally picture, especially given the variety of rail lines that pass through the area. As ever, for the cartographically challenged, cartometro is your saviour and the map below should give some impression of both the layout – and size – of the Old Oak and Park Royal Opportunity Areas themselves. The GLA intends to undertake its masterplanning in-house, but is currently preoccupied with building support for the MDC. While the masterplanning process awaits this, TfL still need to push ahead with rail planning at Old Oak Common. This is partly because of the tight schedule for the HS2 legislation, but also because the success of the Old Oak Common development depends on the public transport links being established early on. This is not just to improve the business value of the development itself, but also because it is necessary in order to build it – the large construction workforce will require much-improved public transport links to the area, of which one or more Overground stations would be a key part. The third consultation comes from a surprising source: Queens Park Rangers (QPR) football club. The club believes that in order to compete at the highest level of the game they need a larger home than the 18,000 seat Loftus Road stadium they currently inhabit in Shepherd’s Bush. 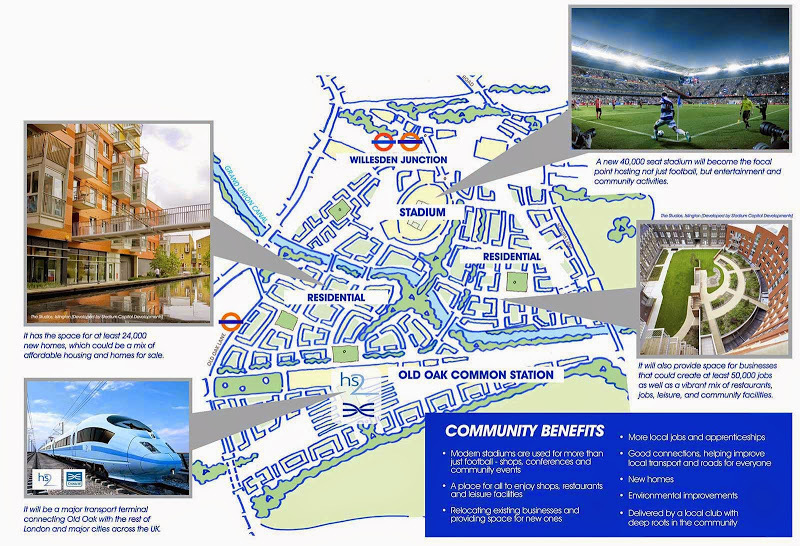 Wishing to stay in the local area and yearning for the comparative expanses at Old Oak Common, QPR are working with Stadium Capital Developments (SCD) to draw up their own grand plan. SCD are the company behind the regeneration of the Emirates Stadium at Arsenal, and they will be soliciting views on a vision for a 40,000 seat stadium in the heart of a new residential and commercial development. LR readers will have to imagine where the rail lines lie in the plan above, but it appears QPR have ambitions over most of the Old Oak Common development site. To QPR, the fact that they don’t actually own any of the land appears to be a mere detail. But one of the major landowners, the retailer Cargiant, have ideas of their own. In a recent statement they professed surprise at QPR’s proposal, in particular that it seemed to rely heavily on land owned by Cargiant, following which they announced that they will present their own regeneration scheme in due course. No doubt QPR will benefit from the PR, but we will watch this proposal, and the manoeuvrings of other developers, with interest. There is one more on-going consultation of relevance: the London Infrastructure Plan 2050, on which LR is midway through a detailed three-part analysis. 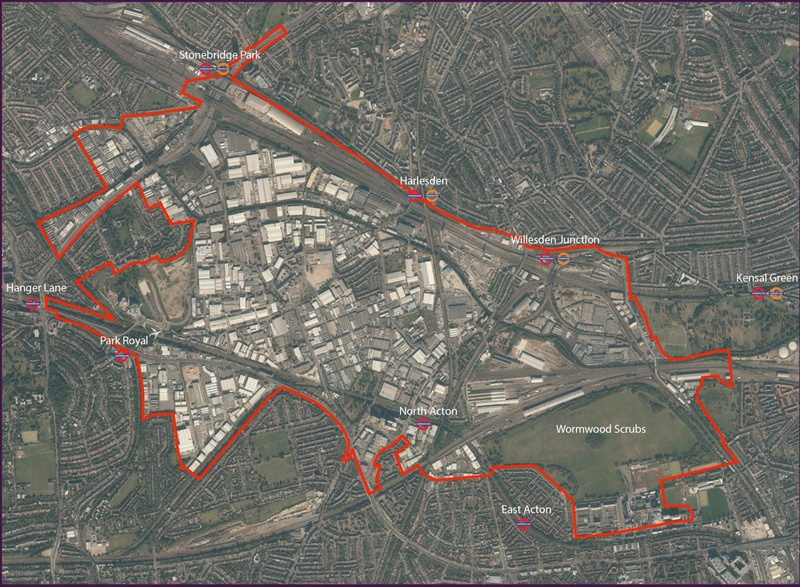 The 2050 Plan provides the strategic policy direction for developments such as at Old Oak Common, as well as specifically identifying Old Oak Common as a satellite activity zone for Central London and a new transport hub. This fits the pattern it describes of emerging clusters outside the central zone, and the need for improved orbital rail links between them. In 2011 the Mayor laid out four conditions which HS2 would need to meet in order for the Capital not to object, one of which was to include an Overground station at Old Oak Common. Studies by TfL and Network Rail (NR) in autumn 2012, and a later study for the Department for Transport (DfT), led to the identification of an impressive 28 options for potential Overground access at the site. These went through a shortlisting process undertaken by Mott MacDonald along with TfL, HS2 and NR. Of the 28 options explored, five options were selected, all feasible within HS2 timeframes. However, following resistance from DfT to the Overground proposal, TfL and NR commissioned a further GRIP 2 (Governance for Railway Investment Projects, Pre-feasibility stage) study in mid 2013. TfL also recognised that, if it wished to petition the HS2 hybrid bill, substantial evidence would be required to present to the HS2 Select Committee. Engineering consultancy WSP and architects Farrells have since been appointed to design three options, which are now presented in the consultation. Beyond this the aim is to identify a single preferred option for a GRIP 3 (Option selection) study in early-2015, so that they can negotiate its inclusion as an Additional Provision to the HS2 Phase One Hybrid Bill, due for publication in December 2014. If successful, this would potentially allow work to start on the preferred Overground solution at Old Oak Common as early as 2016. As the proceeding paragraphs probably suggest, there is a fascinating game of pass-the-funding-parcel being played at Old Oak Common. While TfL and the GLA are reliant on HS2 to underpin the whole hub concept, they have been diligently petitioning HS2 on the Mayor’s four conditions and negotiating over who carries the cost. But at this stage it is still not clear whether the Additional Provisions will include safeguarding for an Overground station at HS2, or for the Crossrail-WCML junction. The urgency for DfT and HS2 to clarify such details no doubt partly explains the recent strange announcement by the Transport Secretary Patrick McLoughlin on the proposed Crossrail branch to Tring on the WCML. HS2 badly needs Crossrail to provide relief for the WCML in order to enable work to proceed at Euston. McLoughlin’s announcement however arguably also strengthened TfL’s own hand. For if the government wants Crossrail to extend to the WCML, its design must not detrimentally impact the Crossrail service as planned, and the government will need to pay for it. Fascinating though this context is, it can’t provide an easy milieu for the Old Oak Common transport planners to work within. 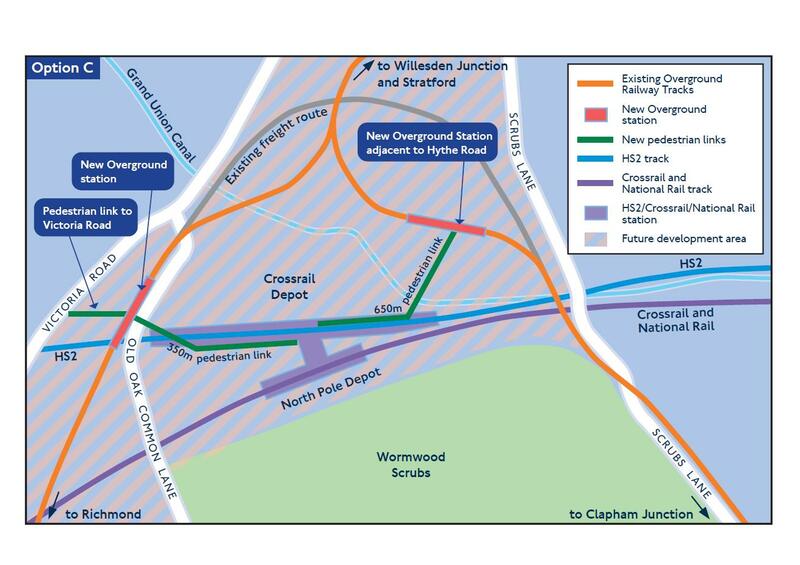 TfL is consulting on three options for new Overground connections at OOC. Option A proposes a new Overground station on the west-side of the OOCOld Oak Common station site, with a 350m walk to Crossrail/HS2 station. Services would leave the WLL via a new grade-separated junction at Mitre Bridge and run on new tracks along the south side of the IEP depot. The route then has to curve back on itself to rise up to Acton Wells Junction and the new platforms, before continuing on to Willesden Junction. This route was explored in detail in our 2013 articles. It is a cut down version of an early plan that neatly caters for multiple route options using an Overground station on the south-side of the Old Oak Common complex, much closer to the Crossrail/HS2 platforms. However TfL has rejected a south-side station entirely, and we don’t know the reason for this. Perhaps it is the cost of bridging across the Intercity Express Programme (IEP) depot, although provision for this has actually been made in the depot planning permission. Maybe TfL want to avoid the confusion of Overground platforms at multiple locations. Perhaps a station on the south side would entail too much encroachment on Wormwood Scrubs, which is protected Metropolitan open space. All are possibilities. 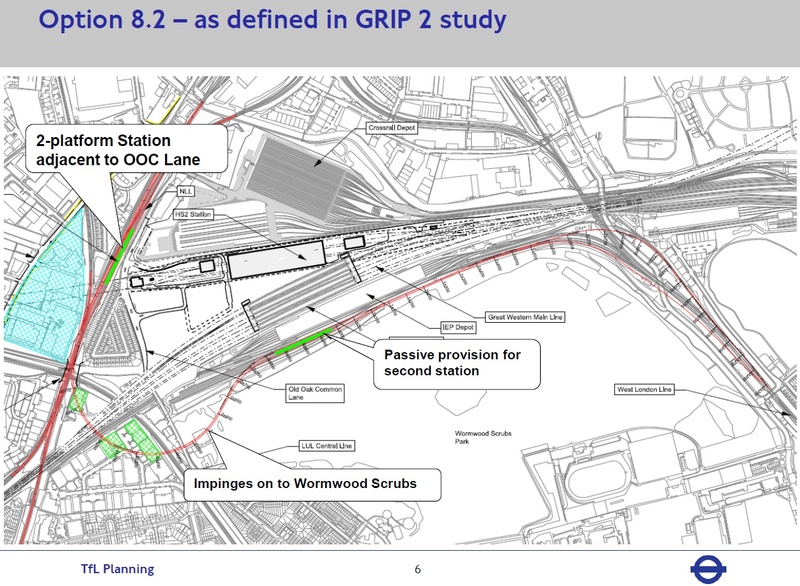 A slide from an earlier TfL presentation shows this design as option 8.2 in the GRIP 2 study. The diagram offers more detail and notes passive provision for a second station on the south side, and this safeguarding may still be envisaged. But what of the route from Acton Wells Junction to the Midland Main Line (MML) and the proposed Hounslow to Brent service? Although this is a component in the Mayor’s orbital route outlined in the recent 2050 Vision, this is airbrushed out of the Overground options at Old Oak Common. Not even the route is shown on the maps. 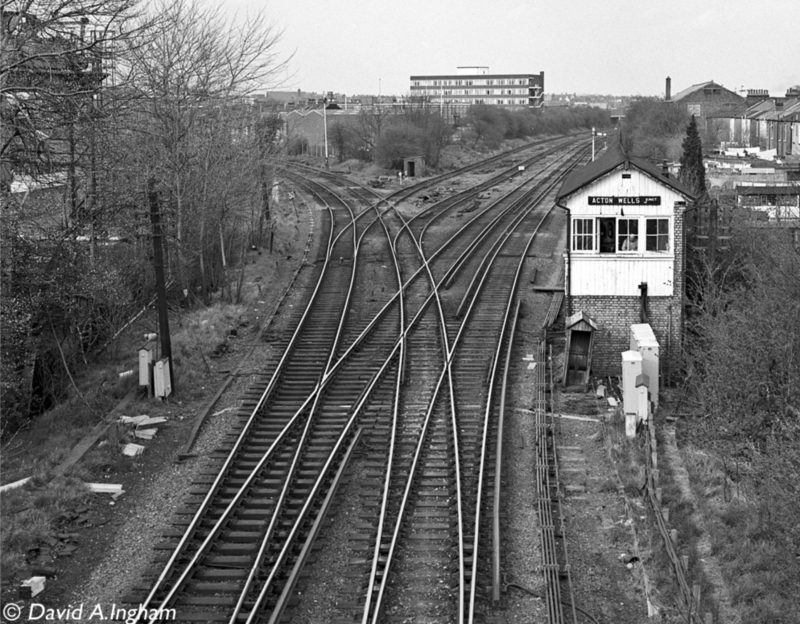 The photo below shows Acton Wells Junction with the route to the MML branching northwards to the left. The west-side Old Oak Common Overground platforms will be located just north of Acton Wells Junction on the route to the right (towards Willesden Junction). The alignment here used to take five tracks, so there is space to locate new platforms. What is not clear is whether it will be possible to provide platforms for the Hounslow-Brent route on the left. If indeed it is possible to locate platforms somewhere around Victoria Road, then the interchange distance from Crossrail/HS2 platforms could be over 500m, which is far from ideal. UPDATE 27-9-2014: TfL advise us that they are working closely with London Borough of Hounslow to ensure that, whichever option they go for, an extension to Hounslow can be added later with a stop at the new station on Old Oak Common Lane. The platforms in all options will be 8-car compliant. Of Tfl’s suggested options, option A offers route simplicity but the west-side platforms are a long walk from the main station so interchange is far from perfect. It would also concentrate services over the flat junctions at Acton Wells, which would likely become a bottleneck as services intensified. Option B is more modest, and carries less risk in terms of planning and deliverability than option A. The current Overground service from Clapham Junction to Stratford would instead run over freight tracks through Willesden Junction before swinging south into the west-side station at Old Oak Common. At least, that is what we assume; the diagram is ambiguous. 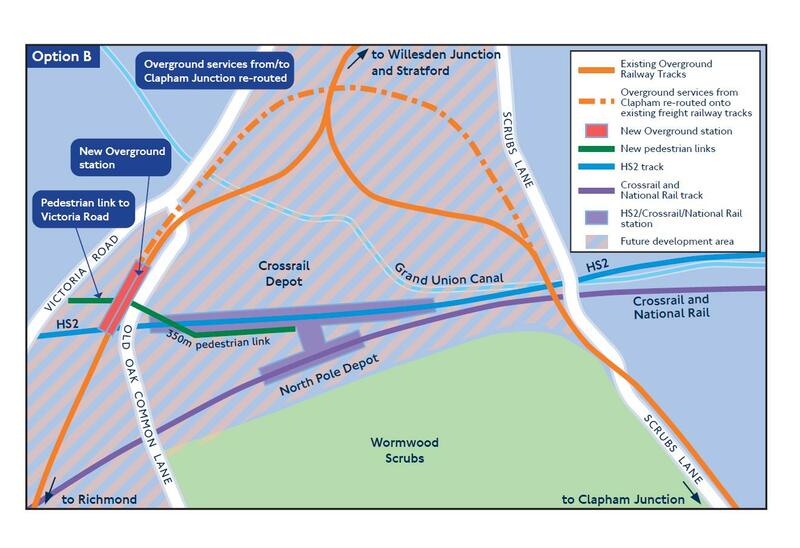 If the Overground service from Clapham Junction to Stratford is to be retained, it will either by-pass Old Oak Common going straight to Willesden Junction, or it will reverse at the new west-side station. Closer perusal of TfL’s January 2014 presentation to the Golden Mile Transport Group suggests the latter – services will indeed reverse at Old Oak Common, which will incur a 10-minute time penalty for through passengers. UPDATE 27-9-2104: TfL advise us that Option B only works if the service is split, effectively sending half to OOC to terminate and half to Stratford but bypassing OOC. The timetabling doesn’t work with all 8tph coming into OOC from Clapham and reversing on to Stratford. So, while option B is cheaper to build, at around £140m plus additional rolling stock, it is less beneficial in terms of journey time savings. Option A has a higher capital cost, at around £525m and carries more risk, but delivers greater benefits. Comparison table of the options. Passenger numbers, represented on maps which show the area in detail. Technical summary and cost estimates. Another benefit of option B is that Willesden Junction could be served by new low-level platforms, although this is not shown in the diagram. This is a glaring omission. It means that connectivity with Overground and the Bakerloo at Willesden Junction is essentially traded for the more varied menu of interchange options at Old Oak Common. With new low-level platforms at Willesden Junction, passengers could have both. Willesden Junction’s potential role as a second gateway to the broader Old Oak Common and Park Royal development is a topic we shall explore in a future article. Option B derives from option X in the earlier GRIP 2 study, and the TfL slides below provide more detail. The final option C requires even less new infrastructure than option B. A new west-side station is joined by a new east-side station on the existing route from the WLL to Willesden Junction high level. This new east-side station is more convenient for QPR’s putative stadium development, but a 650m walk somewhat stretches the definition of interchange. It is also very close to the existing station at Willesden Junction. Overground services would continue to use their existing routes, but with new stations at Old Oak Common. Apart from the inconvenient interchange, the clear downside is the split between two stations. Interestingly, the local community group Save Our Scrubs is strongly opposed to option A because it impinges on Wormwood Scrubs, and is lukewarm about option B because of the impact it will have on residents in the Wells House Road area. 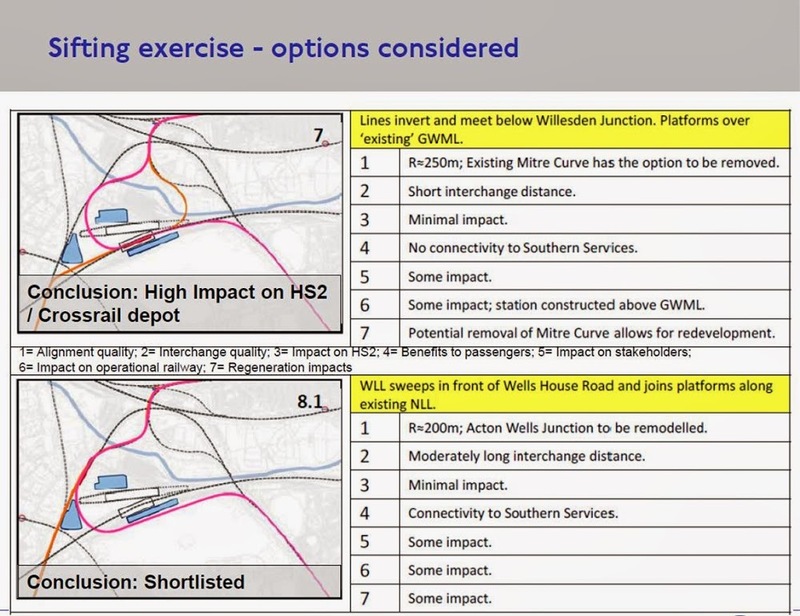 Their vote goes to the two stations on offer in option C.
These three options have emerged from an iterative process of ‘optioneering’ over the last two years. The images below, from TfL’s presentation to the Golden Mile Transport Group, illustrate the decision process. Note the criteria used to assess the options: alignment quality, interchange quality, impact on HS2, benefits to passengers, impact on stakeholders, impact on operational railway, regeneration impacts. There is no indication of the relative weightings of these criteria, but achievability in terms of integration into the development as a whole is a key factor. Indeed the constraint of not treading on the toes of HS2 or Crossrail at Old Oak Common means that some worthy Overground designs will have been rejected early on, and this may already be leading to a sub-optimal outcome. UPDATE 27-9-2014: The edited (i.e. public) version of the Options Assessment Report on the TfL consultation website has maps of the options which were considered. What are we to make of this consultation, and these Overground options? It is likely that those looking for some kind of bold statement will be a tad underwhelmed. The whittling process appears to have stripped out options that offer better interchange and potential routes. It is hard to see this as a confident step towards the sort of bold and integrated masterplanning that the Park Royal development will require. An interchange involving a lengthy walk will entice fewer passengers. Not only will this not provide the intended relief for HS2 at Euston, but it may push more passengers on to Crossrail. A south-side Overground station would be much more convenient than a west-side, but no option is presented for this. The east-side station presented in option C is more convenient for that side of the development, including the proposed QPR stadium, but a more coherent clustered interchange would offer far more route options. Plus there is far greater potential to improve interchange at Willesden Junction, yet this is not explored. A south-side station would also allow a WLL-Brent service. This may become a preferred option to the proposed Hounslow-Brent route if platforms cannot be provided on MML branch from Acton Wells Junction. It is also vexing, albeit understandable, that these Overground proposals for Old Oak Common are presented in isolation. Potential synergies with Crossrail are not explored, and the nascent Hounslow-Brent service is pretended away. It is also strange that there is a consultation over the potential station locations, but none on the route pattern. The assumption appears to be that Old Oak Common should be designed for existing routes, rather than for a new route pattern that better serves the needs of west London travellers and the limitations of the site. This is exemplified by the inadequacies of option B, involving a lengthy and inconvenient reversal for services from the WLL, mention of which diligent LR readers will have noticed is conspicuous by its absence in the TfL consultation. If a vote was forced here at LR Towers on the suggested options, it would likely result in the nomination of option A over B and the forgetting of option C. In an ideal world, however, option A would come with a south-side station and safeguarding of future links to the SW and NE, as originally proposed. In a development of the scale of Old Oak Common, this would perhaps not be too much of an ask. Ultimately with a clear vision and leadership, the panoply of stakeholders and co-dependencies at Old Oak Common could result in synergies that would yield a new transport hub par excellence. It is hard to see how this can happen if good options are discarded, however, simply because it is deemed too hard to piece them together with other parts of the puzzle. This is something that all of those involved in planning the area would do well to remember. Unsurprisingly strong support for an Overground station, and unsurprising lack of support for Option B. Option C pips Option A to the post, mainly because of opposition to infringement on Wormwood Scrubs. Will be interesting to see how things proceed from here. “1.22 This option would see Clapham Junction to Shepherd’s Bush services extended into Old Oak, running onto the existing freight lines into a new three-platform station on the Richmond to Stratford route, adjacent to Old Oak Common Lane. Access to the HS2 (to the east) and Victoria Road (to the west) would be via a subway link. Option B does not reduce the number of direct Clapham Junction – Stratford trains at 2TPH typical. Addition of low level platfroms on the south side of Willesden Junction could remove reversing trains from the high level platfroms (thus creating more capacity for the Richmond – Stratford axis) and these trains supplemented by the Shepherds Bush trains extended could provide a total of 4TPH between Clapham Junction and Old Oak Common, all of which could then call at Willesden Junction for interchange with Richmond – Stratford trains. I believe that we may be seeing a starting position here. Once the OOC area is established, people changing there will dislike the inconvenience of the interchange, and I believe we will see the IEP depot being moved, and the space on the edge of the Scrubs being replaced with platforms. Until such time, it adds to the expense of starting up the scheme, so we end up with something none too great. So if half the trains to Clapham Junction go from Old Oak, and half go from Willesden Junction, where do you go to catch your WLL train? Surely Crossrail needs to link up with the Watford to Euston line at either Willesden Juncton or Old Oak Common. Even better. It the London Overground/Bakerloo line were to connect with the Metropolitan line by building a combined station at the junction between Kenton and Northwick Park stations where the lines cross over would bring even more potential passengers into the equation. Shut both Kenton and Northwick Park stations to free up more space for housing and have an interchange here. The above consultation is only for the LO changes that are under TfL’s direct control. There’s also a parallel activity going on to investigate how to run Crossrail up the WCML anyway, (as flagged up in the London and SE RUS in 2011) but that’s being organised by DfT and HS2 Ltd.
My understanding is that the consultation for the Crossrail-WCML link was postponed because HS2 was running into trouble, on account of budget blowouts associated largely with the Euston approaches and rebuild. So contractor were laid off and on-going work was out on hold. Of the two original options, only one was being progressed: a climb north from OOC to briefly run alongside the Dudding Hill line, before dropping down to the to the WCML freight line which passes beneath the mainlines and joins the WCML Slows through a flat junction south of Wembley Park. That’s fantastic news! I’m so looking forward to seeing that area developed. Of course, we need a third LO station at North Acton to change onto the Central Line but that’s another complaint. Good something’s being built, disappointing on their choices. Old Oak Common Lane (OOCL) should be further south IMHO, adjacent to Wells House Terrace, on a four-track section (so, either a pair of islands or two side platforms and an island, with all junctions south of the station). The distance from the northern platforms would be as far to the HS2 station as the planned southern end would be, but crucially, you’re far closer to North Acton, whose platforms could be relocated east at a later stage for more direct interchange. Plenty of room for 8x20m platforms, and you could even manage 8x23m if you so desired, all without even needing to have platforms over the GWML. The western side is more complicated. I appreciate wanting to have a station in the middle of the new development (or at least, near-as) …but it will be so close to Willesden Junction….really, really close – less than 500m (platform to platform)! Mark Townend’s general suggestions have always made far more sense to me; low-level platforms on the WCML loop at Willesden Junction are only marginally further, but tie in with the rest of the network more effectively. If you really wanted, an and/or option of a station on the WLL at Mitre Bridge Junction (mirroring OOCL) would be almost as effective as the proposed Hythe Road, but crucially could even serve Southern services heading up the WCML without all the work required to bring them to the GWML station. I had the idea that it could be build on land that currently part of Victoria Industrial Park, 300m east of North Acton tube station. An overbridge could be built over the A4000 to facilitate interchange. So, the design process to create an Old Oak Common interchange has produced two more stations, both an inconvenient walk from the proposed Crossrail/HS2 station. There will now be six poorly connected stations within a mile radius around OOC. It’s hard to see this as an exemplar of integrated and visionary masterplanning. Not sure who did the public consultation, but I am appalled at the decision taken. This means passengers using the West London Line have no access to the HS2/Crossrail complex, wheras the Milton Keynes – South London service will run right around the edge of Old Oak Common and not stop at all. In my opinion this decision will increase the pressure to electrify the South West Sidings and provide a service off the West London Line to Old Oak Common Lane station, with a further extension to somewhere sensible (Hounslow perhaps?). 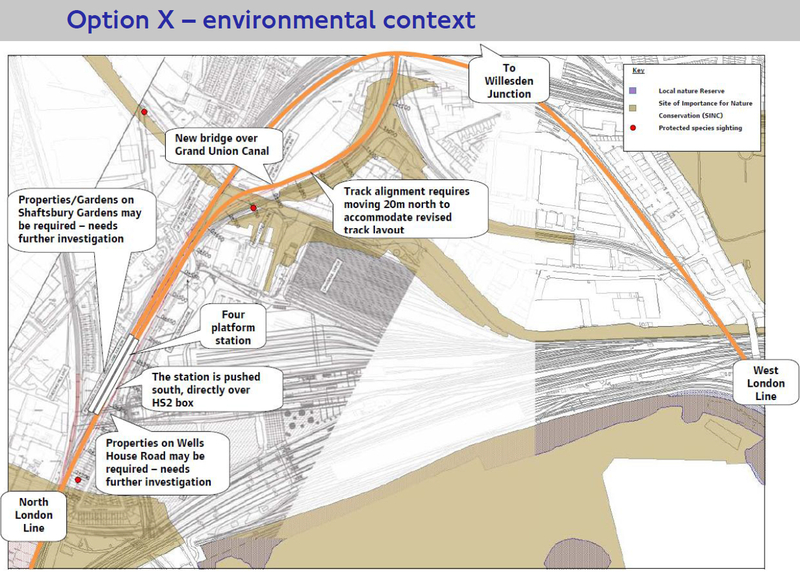 What’s that thing marked “pedestrian access” from the Hythe Road station on the WLL to the HS2/XR station? Not ideal, but doubling back from Shepherds Bush is possible. If the Tring branch of Crossrail comes to pass, there will be better alternatives. @timbeau: What is the point of building HS2 and cutting an hour into the journey time to Manchester if you then tell people to walk 600m to catch the Overground because TfL felt a bit stingy? Also, what is the point of building up a cluster of skyscrapers as an alternative city centre and then making 1/4 of the trains serving it from one direction run through that area? Imagine 1/4 of Crossrail trains not stopping at Canary Wharf. Have you been to Stratford? Or St Pancras for that matter? The treks from HS1 to other lines are just as long. And the 600m connection is just one branch of the Overground – that to Clapham Junction – for which the time saving, even with a trek through OOC, will be much more than an hour: at present the only practical route to Manchester from any station on that branch requires you to travel via Euston – which requires a change at Oxford Circus or Victoria. (although Clapham Junction will have a direct service via CR2 if that ever happens). As for the Watford services, why would Watford passengers want to go to OOC to pick up HS2, when they have direct trains to Birmingham, Manchester etc already? The time taken to get to OOC and change trains, and the shorter journey time from Watford to WCML destinations compared with the time from Euston, would cancel out most if not all of that one hour saving. Some of the other proposals would have extended through journeys by quite a margin, and /or would have been operationally complicated – reversals etc. To be pedantic, only half of Crossrail trains will call at Canary Wharf – the ones on the Abbey Wood branch. And it remains to be seen whether all GWML services would call at OOC. But the classic line serves other places than Watford – can you imagine the objections if Milton Keynes, Rugby, Coventry, Tamworth, Stafford, Stoke, etc were to lose their train services? @timbeau: If OOC is to become the employment hub that the Mayor claims it will, there will be demand for every train (at least every local one) from every direction to call there. Yes, there may be a Crossrail service calling at OOC in the future, but that Crossrail service will not run to places like Leighton Buzzard or Milton Keynes that the MK-South London train serves. Exactly how long do you think the DfT would survive if they announced the temporary closure of the Great Western Main Line, West Coast Main Line, the West London Line, and the North London Line, as well as bits of the Central Line, while they razed big chunks of said railways to the ground and rerouted them in order to build this “ideal” interchange station? Just because it’s possible to redraw some lines on a sheet of paper, it doesn’t follow that said redrawing can be done in real life without massive disruption to services for years on end. We tried this kind of “big bang” approach in the 1990s with the West Coast Route Modernisation. As I’m sure many here will tell you, it did not end well. I agree. Sometimes grandiose was also tried at London Bridge and that’s not going very well either. It’s odd to me that TfL are getting it in the neck because of the interchange distances when their lines were there first. Isn’t it more accurate to say that the propose route of HS2 is wrong and should have been slightly further north. And just because the interchanges at Stratford and Euston-St Pancras are crap doesn’t mean OOC has to be a case of same again… But cynical old me suggests that it will. After all, it worked “perfectly well” last time didn’t it? Except, of course, if you “descope” too far you have got nothing worth having. Or. alternatively, you have DLR fiasco, where it has to be rebuilt three times …. Most of the proposed “longlinks” between the separate parts of the OOC complex are on the flat aren’t they? Travolators, Waterloo-Jubilee line style is surely the answer to that? alternatively, you have DLR fiasco, where it has to be rebuilt three times …. Surely it was only rebuilt twice? It was built and then twice rebuilt. @Greg T – or the motorway widening programme, for example. Indeed, I noted that someone has already spotted that Osborne has made a”useful” saving in advance of the March budget…. Actually, I suspect the descoping will continue next with merely rebuilding Euston – “Good News for the people of Camden”, then OOC – We need housing not offices”, and then the retreat from the north. The Crossrail Depot prevents the HS2 station to be further north and TfL builts it. Also by far most of the interchange expected at OOC is happening between HS2 amd Crossrail and I don’t think you could move the GWML north either. What is sad is that, due to the pressure to limit costs and respect schedule, of its own ‘little’ project alone, HS2 Ltd’s strategy (do they have a the choice) is to avoid any additional things to deal with. That include considering having a viaduct with a NLL-WLL station on top of their OOC High Speed station. 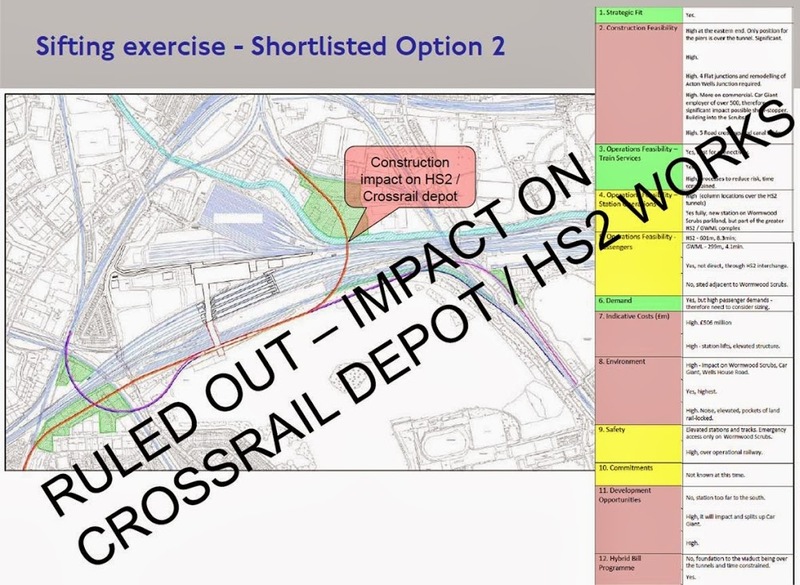 In Option C the Overground stations are clear of the site therefore HS2 Ltd is less likely to suffer from the impact of their construction and could even avoid paying for them at all. @Anomnibus: In case you haven’t heard, the population of London is soon to top 10 million. You can either make the current 8 million suffer engineering work, or make the future 10 million suffer congestion all round. OOC was meant to draw the pressure on office space away from the CAZ. If you make it impossible to get to nobody will want to locate their offices there in the first place. We therefore might as well not bother building anything at OOC just because people will be a little upset over a few weeks of engineering work. The same petty mindedness is evident with regard to the planning of the OOC site. Everyone wants to retain the capability of stabling trains on swathes of land there, but without entertaining the possibility of building over these depots. But of course nobody has the few million bob to fund these relatively simple design changes to make the site so much more accessible and therefore valuable. With TfL’s latest announcement I doubt the whole thing will take off altogether. PS – It’s also very easy to speculate over the issues at London Bridge from Italy (or wherever you’re sitting) but if you ever came to look at the concourse in the peak you would notice the current problems have got squat-all to do with the size of the concourse or trains getting delayed and all to do with the very existence of a ticket barrier on said concourse as well as crowd management. It’s also worth noting that the hardest part of any major infrastructure project like this is getting it off the drawing board. Once you’ve done the first iteration, you can then ponder and beard-stroke your way into making alterations to it in future should that be desirable, but the point is to get something built first, otherwise it’ll never happen at all. I was born and raised in south-east London. I was using London Bridge back when it was undergoing its last rebuild, in the late 1970s. I can still remember the “good old days” of British Rail at Kent House and Clock House stations, when a mere two trains per hour was considered a “high frequency” off-peak service. The former still had a porter at the time. I may be living in Italy, but I haven’t been here that long, and we do have broadband Internet here, so I’m quite capable of reading up on progress, and watching the BBC’s news reports. And using Google too. Hell, I can even reply to your post! I can also remember when the current Thameslink upgrade project was still branded as “Thameslink 2000”. You know: after the year it was supposed to have been completed. It’s going to be completed about 18 years late. London Bridge barely coped when everything was working smoothly. Delays of as long as 20 minutes were not uncommon on the few occasions I had reason to commute via that station. So struggling to cope when half the south London rail network falls over, leaving London Bridge as the only viable option for many, is hardly a big shock. It would have struggled even before the rebuild began. Bad things happen. They always have. Projects on this scale rarely go completely smoothly. The Italians may have their faults, but they do long-term planning in exactly the same way that Brits don’t. Bernard Woolley would be proud! Some inconsistency here – do you want it easy to get to, or easy to get through? It may make OOC more convenient for interchange if the various stations are integrated, but that is of no concern of the developers: on the contrary, there is no benefit to the developers from such passengers unless they can catch some retail business from them as they pass through – and the longer the interchanges the more opportunity there is for that! If you want OOC to be easy to get to it doesn’t matter that it is served by several stations dotted around the area – in fact it actually helps. The OOC area is not much smaller than the City of London (“Square Mile”). Can you imagine all trains serving the City having to use a single station instead of the dozen or so there actually are? What would office values be like in Bishopsgate if the nearest station was Farringdon? If I may make a comment, I am not sure that rebuilding large amounts of infrastructure around Old Oak Common with the express intention of facilitating connections between the multiple public transport routes in the vicinity actually contributes to the aim of creating a major employment hub or provides a net benefit compared to the current proposals. The primary transport requirement of an employment hub is surely access, not interchange. In fact, dotting stations around the development area surely has some positive attributes – it reduces localised pedestrian congestion; reduces pressure on pinchpoints such as station entrances and passageways; reduces the length of average access routes from the range of public transport nodes to single points, i.e. places of employment, in the area (thus reducing the tendency for property value to fall with distance from a single station); and enables progressive upgrade of transport facilities and/or progressive development of sub-areas with minimised disruption because not all routes come together at a single point (the London Bridge issue, if you will). Canary Wharf notably does not have direct interchange between DLR, Jubilee Line and (in future) Crossrail, but to the best of my knowledge hasn’t turned out to be a failure as a result. While it would be nice to envisage an easy interchange in every possible direction, especially viewed from here in the West Midlands assuming arrival by HS2, I am prepared to accept that the distribution of people to points around the Old Oak Common complex by the use of different nodes can be advantageous. In any case the addition of the HS2/Crossrail connection alone represents a huge improvement in access options from and to Heathrow, the West End, the City and Canary Wharf for us provincials (at least those of us to be blessed with HS2 services whether captive or classic compatible) and our business and leisure visitors. The walking distance between the different stations at Canary Wharf (Crossrail, DLR, Jubilee Line and Heron Quays DLR) is about 200m. Which doesn’t really matter that much. Canary Wharf is a destination, a very small proportion of people will use it as an interchange. OOC – on the other hand – will be both a destination and an interchange. Now: does it make more sense to make people walk (or take a bus) for 10 minutes from the station to the office at the start/end of their commute or does it make more sense to make people walk (often with luggage) for 10 minutes to get to/from a high speed train? Plenty of people have given various arguments about retail opportunities, accessibility, etc. However, a transport hub – and OOC will first and foremost be a transport hub – should have transport as its primary function, with retail and so on built around it. Berlin Hauptbahnhof is a perfect example of this: it has tens of shops and food outlets (and all seem to be doing well commercially), yet it would take no more than 10 minutes to get from the high level to the low level platforms in a wheelchair, without being exposed to the elements. How will the walk from Hythe Road to HS2 compare? @Anomnibus: are there live CCTV feeds from London Bridge available too? Because the main and most dangerous problem is not that trains on the approach to London Bridge are often delayed, but that the gateline cannot cope with getting a 12-car load of people (ca. 1200) from the concourse onto the train in about 4 minutes (which is the typical time from the announcement on the board to the departure of the train). he who pays the piper – will the developers pay to move the platforms closer together if they do not themselves get the benefit? “does it make more sense to make people walk (often with luggage) for 10 minutes to get to/from a high speed train”/”At Berlin Hauptbahnhof it would take no more than 10 minutes to get from the high level to the low level platforms in a wheelchair, without being exposed to the elements.” As far as I am aware ten minutes in Berlin is the same as ten minutes in Acton. And why would the walkway not be covered? “How will the walk from Hythe Road to HS2 compare?” It is shown as 650m (although nearly half of that is alongside the HS2 platform, so an entrance at the east end of the HS2 station could shorten that). 650m in ten minutes equates to 3.9kph, or 2.44mph. So, a fairly relaxed walking pace then. @timbeau: Indeed, it is the one who pays the piper that calls the tune. Sadly, whenever developers make transport interchanges (be it in London, Budapest or Poznan, Poland), these will be inevitably bad from the passenger’s point of view. Unless you tell me that dodging throngs of shoppers for 500m at Stratford is a ‘good’ interchange from a passenger point of view? And I bet that the shoddy location of Stratford International has held back passenger growth: Whatever pasengers use HS1 and change there to Canary Whrf will cease to do so once Crossrail is up and running. And try not to twist my words if you could, please. Ten minutes for interchange at Berlin Hbf is the worst-case scenario (passenger on wheelchair or with luggage), and that is specifically from leaving one train to entering another. Once again: how does that compare to OOC? With Old Oak common potentially being a construction clone of Stratford International (Greg’s apt name for it being Stratford-in-the-Hole) with 4 TBMs launching from a very big subterranean concrete box (and all the extra logistics that brings with it), both TfL and HS2 probably want to keep out of each others way to make construction easier – decent passenger interchange in the longer term being less important. With HS2 probably at a very different level to CR/GWML the chances of the pedestrian links being level(-ish) aren’t that great. “Unless you tell me that dodging throngs of shoppers for 500m at Stratford is a ‘good’ interchange from a passenger point of view?” No, of course not – I didn’t say it was. What I did say was that, from the viewpoint of the owners of Westfield, it’s great. firstly the owners of the land, and eventually the people who will want to go to the premises on that land. They would like lots of stations dotted around the area in question, so that the whole area is readily accessible. fourthly, the railway operators, who want it to be done as cheaply, simply, and quickly as possible. Not only are group 2 only one of the competing interests, but the purse strings are held by groups 1 and 4. Irrelevant. I’m not going to sit here watching such feeds in real time, but the various news channels clearly have no difficulty finding willing donators of videos shot from their mobile phones. The station is being completely rebuilt while still running services through it. Exactly how do you expect all this work to be achieved without causing any disruption whatsoever? As others have pointed out, the reason there’s only one entrance to each platform is because they haven’t finished building the other exits yet. What, exactly, do you expect them to provide instead? Yes, it’s a pain in the proverbial to use a station when it’s undergoing such a transformation, but it’s not as if nobody was warned that there would be disruption and discomfort. Londoners should be used to this. Thameslink services were shredded to bits for ages while Blackfriars was being rebuilt, & while the East London Line was closed in its entirety while being converted for use by the Overground. I suppose they could have just shut down all the lines out of London Bridge entirely. Because that’s really the only other option available to Network Rail here. If this reduces capacity, you have to find some other way of getting the rest of the people home. Indeed, but what are they supposed to do? Take a three year sabbatical from their job? Perhaps, with hindsight, it was a mistake to close half the through platforms before the terminal platforms were all ready? There is no point running an empty train. Er, isn’t there a London Bridge thread somewhere? This article is about Old Oak Common, so please could we try and refocus the discussion on how OOC could be designed as an efficient and resilient interchange… perhaps learning from experiences elsewhere? Oops – I think there was a crossed line somewhere there. In my defence, m’lud, I was responding to the previous comment, and didn’t notice that comment was on the wrong thread. And it does so as well as can be expected. I still fail to see what the big deal is. NR are clearly damned if they do, and damned if they don’t. After all this folderol over London Bridge, what, exactly, is the benefit of keeping stations open while rebuilding them? Old Oak Common is going to involve HS2, the GWML, Crossrail, and two LOROL routes. That’s five key lines. Why would Network Rail and HS2 bother trying to keep them all open while working on wrapping three brand new stations around them, if the only “benefit” is years of endless negative press and whining? Shut as much of it down as you can get away with and build it as fast as possible. Once the shiny new bauble station is opened, the public’s notoriously short memory will do the rest. Result? Infrastructure appears more quickly (and, in theory, more cheaply too), and fewer people remember the wailing and gnashing of teeth while it was done. London Bridge’s rebuild may be the last time Network Rail bother trying to please most of their customers, most of the time. It’s just not worth the aggravation. So, if we assume that the powers-that-be would like to avoid another London Bridge, how does that affect the spec for OOC? Firstly, a key requirement of the Overground design is that it does not impinge on the HS2/Crossrail build. Therefore worthy options were discarded early because they would have required a greater degree of integration between TfL, Crossrail and HS2 than was thought possible. But if you decide to partially close the railway and complete as much of the build as possible as an integrated design, then this fundamentally changes the spec overall. You could then integrate an Overground station within the heart of the interchange. Secondly, the OOC/Park Royal development requires improved public transport services in order for it to get built. The plan appears to be to provide new Overground stations ASAP, rather than make this dependent on HS2/Crossrail. Is this the best strategy? Why don’t you provide a step-change improvement to existing lines, e.g. the DC lines, the NLL, and an intensive bus service from local railheads to the various construction areas? This in turn will effect the specification for the design overall. A couple more points: one is to reiterate that the HS2 station is at the bottom so has to be built first whatever. Having said that, once the Crossrail (GWML Slow) platforms have been built, the GWML can be temporarily slewed over to use all four platforms, allowing the GWML Fast platforms to be built. Once it’s all done then you can complete the final layout and extend an intensive Crossrail service beyond Royal Oak. Finally, is this really NR’s call? Arguably, the fragmentation of the industry and the lack of anyone able to call the shots is the problem. @Lemmo – ” the GWML can be temporarily slewed over to use all four platforms” – can you imagine the disruption that would cause and the time it would take – just to move the trackand signalling?no,I thought not. LBR a walk in the park by comparison. @ Graham H, a little harsh. The current plan is that the GWML Slows will all be moved north to serve four new platforms, and the GWML Fasts will also need to be realigned around four new platforms. The disruption is going to be immense anyway. The issues are whether industry fragmentation is already leading to a sub-optimal interchange design, and how dissipated leadership affects project delivery. Rather than measure the distances from a central OOK station exit, what are the distances from the platform ends? A 3 exit station would allow passengers to absorb much of the 10 minute walks into sitting in the correct part of the train or their safety margin when planning to catch a train. I’d be a lot happier being at the wrong end of a long platform knowing I could join a train if it arrived now, or walk down it for 4 minutes if I had the time. More gate line staffing, but is that really a problem with a busy station? GWML at Old Oak. Much more likely to build 1 platform island and 2 new tracks (i.e. start with existing up relief /CR) then remove the existing single track, build another Island and move 2 over etc. The problem only arises for the last platform island but you just have a temporary use of the 1 tracks from the 3rd phase as you don’t stop the fasts there till the work is complete or opt for phasing similar to elements of Reading or future planned East Croydon for the fasts. Slewing lines is not a huge deal in the grand scheme of things. A weekend closure and maybe a speed limit. Especially on a 4-track line where you are doing them two at a time. The biggest problem with LBR (and will be at Euston) is that it is a terminus, at least for some routes – you cannot simply close it and run trains non-stop for the duration, as they did at Blackfriars Tube for example. OOC isn’t even a station at all yet. Building new platforms, even around existing running lines, can be done without all those pesky passengers getting in the way. Is not part of it that they would have required a greater degree of agreeing who would pay for what than was thought possible? Re: fragmentation, probably the cause of my question above, would the development agency (I forget the correct title) due to come in to being soon have any powers in this regard? @ CdBrux and straphan, certainly the question of who pays is an issue, as we discussed in the article. The stock response from Crossrail on such questions is to refer you back to the project sponsors, i.e. TfL and DfT. Without a change to the spec backed by the requisite funds and powers, Crossrail remains firmly ring-fenced. TfL have an interest to make OOC a success but while they may be willing to underwrite their share of the cost of Crossrail to OOC, the DfT will not. And nor will the DfT countenance any additional cost for HS2. The new development agency will have greater powers, at least to the extent that it can take a more integrated planning approach across the various council boundaries. But it will not address the policy and leadership vacuum that plagues transport policy. So, to return to CdBrux’s point, it isn’t so much the funding that’s the issue, but the need to keep each component ring-fenced so that dependencies don’t set up a domino effect of failures. The favoured Overground achieves this, but is it the optimal design for a visionary interchange and hub? No. Having caught up with the news and the comments I must say I am disappointed. I understand the different propositions put forward by various people but this just feels like an enormous and disappointing compromise. Clearly TfL have been frightened / warned off from touching any land on Wormwood Scrubs. You then have the inevitable botch resulting from “no risk” to HS2 and not wanting to affect Crossrail. I agree with the earlier comment about why on earth the plans for the CR depot could not be tweaked to accommodate oversite development. While I appreciate it is not the concession operator’s remit you might imagine MTR, of all people, would know a thing or two about oversite development including over depots?! OOC is a once in a lifetime opportunity to get *both* access and interchange right and here we have something that is a great big sop to money and politics. I appreciate it was ever thus but generations will live with the consequences of getting this transport connectivity so badly wrong. On a final note I am somewhat exasperated that we seem to be having a national nervous breakdown about the ability of the railway industry to undertake any construction work whatsoever. We’ve had a couple of unsatisfactory events that delayed people and all of a sudden projects are deemed undeliverable, unnecessary or overly ambitious. All this despite loads of evidence that big, bold and complex projects can be delivered perfectly well – Reading, Kings Cross, Thameslink early phases, Crossrail so far, the Olympics, almost all DLR projects, dare I even say Victoria Line upgrade? If only there was some kind of London-wide elected official with transport in their remit who also had clout with the government, and could knock some heads together and work out a better solution… But why do that when there are garden bridges and cable cars to build? pouring over the carto maps, i see the potential for a truly alternative alignment for the WLL into OOC. the Central line RoW via east acton, thanks to legacy construction, is wide enough to accommodate four tracks west of wood lane junction (east of the junction the RoW has been sold off for residential development). with a short tunnel segment reactivating the viaduct junction east of white city station, and running parallel to the central line from a portal west of wood lane junction, the WLL could be routed through east acton station, possibly with a cross platform interchange, and over acton wells junction on a smooth curve into a new four platform station, possibly stacked, at OOC in the currently planned location. this would address the major constraints in the current proposals: the curve would be broader, north pole depot and wormwood scrubs would be left untouched, and both overground branches would continue onto the north london line similarly to how DLR is routed from royal docks through canning town. has anyone ever heard of a similar proposal? is my idea more than just the musing of a lone crayonista? or was it assessed and dismissed along with the dozens of other alignment options? side note: with such an overpass at acton wells junction, the resulting track conurbation would resemble the star trek federation starfleet emblem. The Central Line corridor near North Acton is at least two levels lower than NLL in the Old Oak Lane area, as it goes under the GW which in turn goes under the NLL. In effect you would require major civil engineering at both the eastern and western ends of the route via East Acton, in addition to station costs. 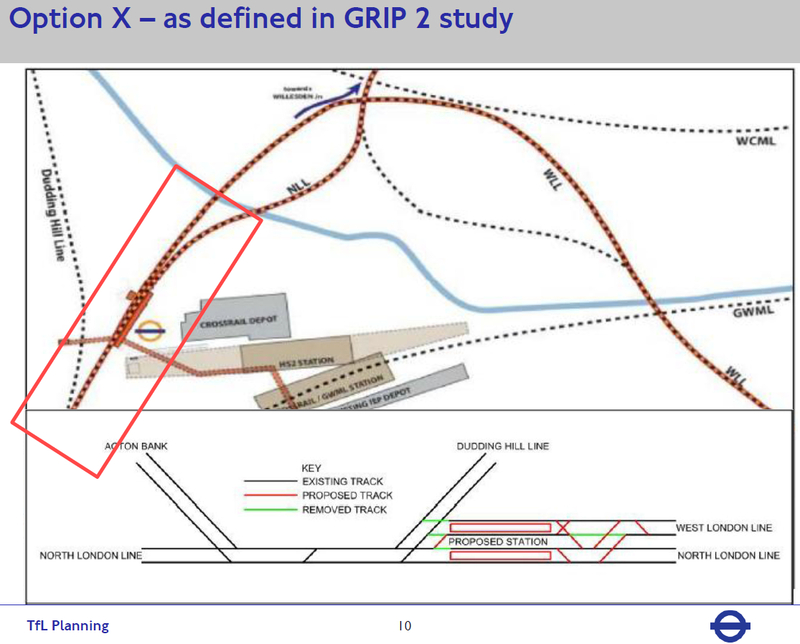 Even if it were feasible (doubtful – a massive double storey embankment or viaduct past housing on the East Acton estate would predictably provoke an outcry), this just doesn’t look VfM compared to TfL’s low cost options which can largely use existing lines with just new station costs, or alternatively a route adjoining the GWR line and North Pole sheds which was an earlier proposition for Old Oak in 2011-12. There is also the significant point that the groups of lands which are amenable to early development in the OOC area are closer to Victoria Road (NLL station) and Hythe Road (WLL station). So it looks that improved access to the stations rather than moving the railway will have to be the palliative for the initial years of investment. An initially fragmented approach to interchange with the Overground can in theory be rectified in subsequent decades, as railway sheds and sidings get moved after the initial capital costs have been written down, and as initially weak land values move upwards to justify higher density development and additional transport investment. The perennial problem of people looking at 2D maps and coming up with ideas. Two words give me very little confidence in this actually happening I’m afraid: West Hampstead. @ PoP Yes, Crayon wielders often get 3D ideas from looking at 2D maps, especially those not showing hills, canals and rivers. As far as OOC is concerned, I suspect the location is now so politically sensitive that any politician suggesting another square yard of concrete there will be aware that the environmentalists will come down hard at any forthcoming local election. There is a “fear factor” for any would be local councillor on this land. @Castlebar – as the development corporation is now extant and can and will override local councils and councillors I doubt the fear factor applies. Yes people may well grumble but Sir Eddie Lister and Boris now have their hands on the tiller until May 2016. If skyscrapers could be built in 12 months from a standing start I’m sure they’d already be on site building them!! Boris recently signed off the allowances for the Board members and also the arrangements for providing support services to the new Corporation. I see from the latest update to legislation for HS2 that the Heathrow Express depot at North Pole is to relocated to Langley near Slough. Is this the depot south of the proposed new HS2/Crossrail/GWML station site or the one to the east of Scrubs Lane? The Heathrow Express depot is not at North Pole. It is part of the Old Oak Common yard complex on the north side of the GWML in the south west corner of the site closest to the main line. The depot has seven open air stabling sidings and a three road shed. A washing plant is situated at the east end of the site. I understand part of the former Eurostar depot was considered for a relocated Hex depot but was considered unsuitable. The Agility Trains depot for the new Hitachi Super Express units for GWR services will use much of the old Eurostar depot, but not part of the east end of the site which is (apparently) earmarked for housing development by the local authority. The proposed Langley site may be the old oil depot there which could be extended onto adjacent open ground as neccessary. 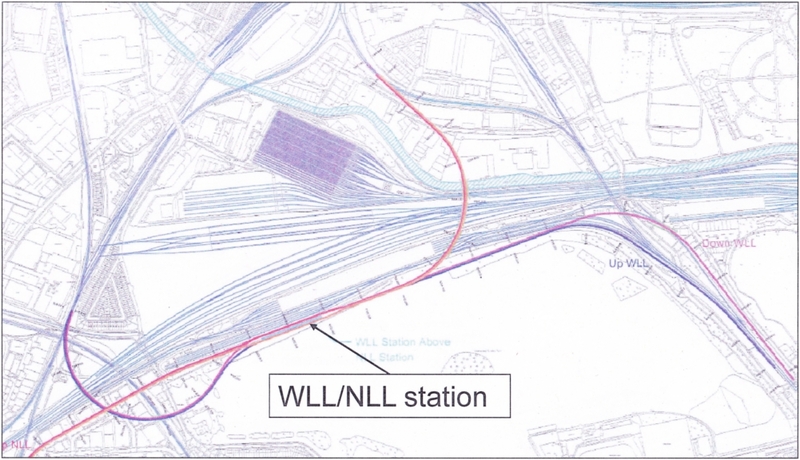 Junction works for the turnouts could be integrated with the proposed WRaTH junctions nearby. The Langley depot site certainly sits very well with the idea of the Hex trains being combined with the WRaTH service, to use platform facilities in the Airport complex most effectively and enable the WRaTH service to call at both T5 and T1,2,3 stations. Potentially interesting developments tomorrow for TfL, London and HS2. This tweet from the HS2Parliament account states something will be said tomorrow. We must await developments and see what has transpired. TfL / the Mayor were witnesses in front of the HS2 Bill Committee today (1/7). Yes, really frustrating for me. I turned up to the Select Committee debate to hear the TfL vs HS2 case. Had to sit through some outstanding business about the Ruislip area including a bit of fact-free hyperbole from Boris. I was crammed into uncomfortable wooden bench at the back and the acoustics wasn’t great. There also wasn’t any air-conditioning. Finally got to the bit I came in for. Mayor’s representative got up … and asked for an adjournment because the two sides were close to an agreement. Waste of a day. As its title shows it’s the response the House of Lords EAC report with justification for need for HS2 to deal with capacity crunch that faces WCML with increasing demands for passenger ( both long distance and commuter) and freight trains an element those against scheme choose to ignore. The report also mentions trans Pennine electrification but this is likely to be complete in HS2.timescale. @ Melvyn / PoP – I managed to catch the committee session via Parliament TV this morning. The statement was made at the very start of the broadcast and was very vague. All that was said was that TfL, DfT, HS2 and the GLA had held discussions and that the issues at Old Oak Common that were contentious for TfL had been “resolved”. However the detailed legal drafting still had to be concluded and agreed before TfL formally withdrew their objections. If the detailed concerns could not be resolved via drafting then TfL would use the later discussion over Euston to reintroduce them. We know from previous comments here about the objections that TfL’s had issues about Overground stations at OCC and the HS2 / Crossrail interchange there. The Bill Committee Chairman asked that the public be made aware of what was discussed / agreed and there were lawyerly murmerings and eventual agreement that a note would be produced for publication. Sorry it’s not very exciting and clearly we have a wait on our hands until we find out what was agreed. 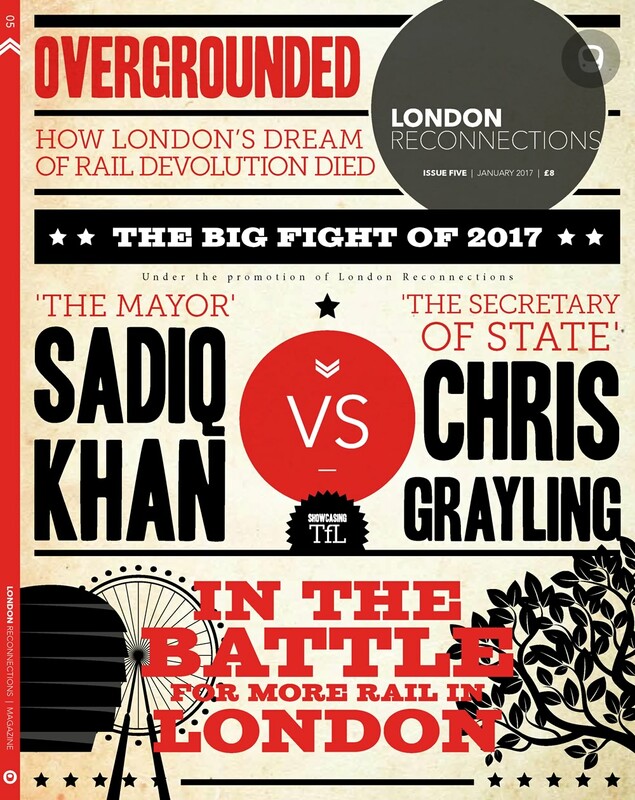 Would OOC still go ahead if it were only Crossrail and London Overground? Even in it’s present form, it is much too useful to ignore – & there will be extensive redvelopment of the greater site, after all. Possibly a highly slimmed-down form – perhaps platforms on one of the existing Overground routes only, and on the slow GWML lines only. It will, ultimately, depend on how deep the pockets of the developers of the site are – and (following O&Y) whether they can keep convincing TfL they will pay until work has started. Thanks for referring to that document. Damn, rumbled…! Sadly I’m way behind on my LR writing, on which I’m very grateful for the patience of the rest of the LR team. A Willesden Jn article was not written, so I’d be interested to read it too! Much has changed since the last Old Oak Common (OOC) article, but in some ways the story is how few of the pencil lines have been inked in. There are several “ifs” here, but if Willesden Jn (WJ) became a major gateway, how might that affect the latticework of lines that everyone is trying to snake across one grand OOC interchange? Perhaps the easier option is to have two interchanges linked by a high-capacity people mover or light rail. Travelling along the main N-S boulevard between OOC and WJ, this could extend to North Acton, and thereby integrate the main routes skirting the fringes. The next “if” is what this means for the service pattern up the WLL and the Richmond route through Acton Wells Jn? Given the growth in demand that everyone still appears surprised about, and the need to establish a tube-style service pattern, it’s not hard to imagine two separate Overground routes: the first being Richmond to the North London Line (NLL), the second being the West London Line (WLL) via WJ to… Harlesden and Brent Cross perhaps? Aha, but what about freight? Well I’ve written about that and it’s even clearer now that something will have to give on the orbitals, and that’s unlikely to be passenger services. Because of the development concentration on the WLL at Earls Court and White City, the WLL will become a high capacity metro route and the freight will have to shift. One option is to route WLL freight via Kew, which requires a relatively straightforward underpass just east of Clapham Jn for Down freights to access the Windsor lines. Happily, this could also be used for ELL services to extend to Putney Bridge or elsewhere… but that’s another story. Suffice to say that the capacity of the Windsor lines will not be overly troubled by a few freights, more that the whole route needs a serious rethink because of the level crossings. That should resolve the Barnes flat junction then. So “if” WLL freights went via Acton Wells Jn, why do you need that screechy curve from the WLL to the high-level platforms at WJ? What might you gain if you relinquished this route to the developers? The Cremorne Bridge refurbishment works on the WLL over the Thames have been completed so the speed limit has been increased helping create a bit of potential additional capacity which hasn’t been used yet. Southern longer term aim now looks like running 8car on WLL services all day instead of the current 8 peak 5 off peak. The P0 issues at Clapham Jn (effectively the current WLL Overground capacity limit) will probably get sorted as part the CR2 works at Clapham Jn so 8 car WLL (and NLL) on the agenda. Recently I used the Southern service from Harrow & W to Shepherds Bush and was amazed at just how slow the link around WJ is. Signed at 20 and 30 and actually going even slowly (it seemed). If there is a plan to make some sort of OOC-WCML link then it needs an entirely new alignment, so I’ll agree that the current upper level of WJ needs to change too. Alison has remarked upon how slowly the link around Willesden Junction is tackled and one thought could be that there’s lots of ‘recovery time’ or similar involved to permit such lackadaisical working of trains (Southern Railway is quite good at that approach at the moment). On the other hand, the track curvature and pointwork thereabouts is pretty sharp, thus providing another excuse for the slow progress. However, I never cease to be amazed by what I have witnessed e.g. in Germany, over many decades, at the higher speeds (as compared with here, including WJ) which trains pass through what we could call sharp curves and through very complex pointwork, especially in urban areas and approaching/leaving stations, viz. the station throats, with track layouts one can only see on a model railway over here these days. In South London, a simple example of my decades of experience of the drift down and pedestrian climb up the spur between Streatham and Streatham Common stations by train despite a green light ahead and sometimes almost to be overtaken by passing dandelion seeds, has invariably reminded me that I am confident that those rails would be taken with more oomph on the Continent. Has Network Rail simply absorbed a previous mindset concerning the ‘set way of applying speed restrictions through curves and pointwork’ without challenge after all these years? There is no incentive for Network rail to increase the tortoise like speeds they impose on curves point work & even straight track. Higher speed equals extra cost in wear & tear & inspection frequency for them. So they opt for min cost solutions even though the savings in rolling stock, driver & passenger time would vastly outweigh the small extra costs they might incur. In a railway where track is split from trains Network Rail rule the roost to the railway’s disadvantage. Local ASLEF drivers on LOROL were being driven as mad as the passengers by the slug like lengthy 10 mph approach their Clapham Junc platforms. Under Silverlink the approach had been at 20mph. ASLEF asked LOROL management if the limit could be restored to 20 mph. Network Rail told LOROL the engineers had ruled it should be 10 mph. I put in a freedom of info request to NR & eventually saw NR’s brief to their consultant engineer. It was is the bridge safe for trains passing at 10 mph! A few weeks after I told an ASLEF driver friend & later it was raised to a still pitiful 15mph. The Mayor of London has ordered a review of the plans and memorandum of understanding signed in March this year concerning the potential redevelopment of Old Oak Common. Although principally focused on housing issues I can see this having consequences for new transport provision at the site and the Crossrail depot in particular. Has anyone else ploughed through the West Midlands & Chilterns draft route study? Marylebone terminal capacity crucial to managing future growth, but rather than hoping for Crossrail 3 (or higher) they’ve recommended creating a new terminating station at Old Oak Common to allow interchange to the Elizabeth line. Looks like the New North Mainline will be seeing a rebirth. I haven’t yet but that sounds incredibly sensible! It would surely be a lot more straightforward to run some of the Crossrail 1 capacity up the NNML, and transfer the Chiltern ‘inner stations’ service to Crossrail, leaving Marylebone for longer distance services only. High Wycombe as the Crossrail terminus maybe? The Faber-Castells are stirring! Cost & timing of electrification & resignalling?? Nimbys of Ealing?? More rolling stock??? Timing?? NB these are rhetorical questions. – Electrification and resignalling is posited for the 2020s when the rolling stock needs replacing. – Cost is £175m-£375m for an upgrade of the New North Mainline, take it to £500m to include electrification. – Option is included in the category “Opportunities to maximise the benefits of HS2 in 2026”. – Option is under development and more work will be done before the Route Study is finalised. Which “Chiltern inner stations” do you mean to transfer to Crossrail? The NNML only meets the Chiltern route at South Ruislip, so Crossrail services via OOC would not pass through Wembley Stadium station, etc. It would certainly be a bit rough for current Chiltern passengers from stations as far as High Wycombe to have only a metro-style service to London. I meant any suitable station within range of a hypothetically extended through Crossrail 1 train towards High Wycombe, i.e. the inner part of Chiltern’s main Birmingham route, rather than ‘inner London’. High Wycombe seems a suitable terminus for Crossrail, it’s no further than Reading after all. The route study draft is fairly non committal about which or how many terminating services would be diverted, probably too early for them to commit. But an incredibly fast service to OOC effectively providing the semi-fast. With the Crossrail to Tring idea, one feels it might be hard to add another western branch onto Crossrail. Marylebone would arguably take the Mainline services to Oxford and Birmingham, and ‘metro’ services to Aylesbury via Am and GX/Wycombe – the former two because they are the more premium routes that would demand a zone 1 terminus, the latter 2 as the NNML doesn’t serve the stations they do. OOC (which the draft route study mentions “one or more turnback platforms”, suggesting that they don’t plan on sending many trains this way) would take the ones in between – the London-HW-Aylesbury(-MK) service and the Banbury/Stratford service – both currently only 1tph (off-peak). They would combine to give a 2tph service from Gerrards Cross, Beaconsfield, High Wycombe and Princes Risborough to OOC, which could be handled by one platform. Interesting that the West Ealing to High Wycombe service previously proposed doesn’t seem to make an appearance in the draft route study. I suspect that’s a ‘best use of available capacity’ decision. If the line is almost full should you be adding an extra service to west Ealing or to your main termini? I think the Greenford branch will remain an isolated stub for the foreseeable future short of massive house/job growth along it. Re: Si. The “2043 Unconstrained Indicative Train Service Specification” on page 42 indicates what I think is a maximum of four trains per hour serving OOC. If I’ve understood it right the Study’s purpose is to indicate what could be achieved if funders dig deep, so this does not amount to a plan to provide such a service. Snowy, Ian J: say 500mn and open in 10 years time, with a 25 year payback period. How much traffic does it create or accommodate? TfL, operator of the Elizabeth Line, will receive no revenue support grant in that period, if current trends continue. @OB: that is exactly what the further studies mentioned will be determining right now. The point being that Network Rail seem to see it as potentially accommodating as much traffic and at a similar cost to expanding Marylebone (buying back the land British Rail sold off would cost a fortune), while also generating new journey opportunities and so economic benefits. Final Network Rail West Midlands & Chiltern Route Study published today. No mention of transfer to Crossrail/Elizabeth line at present however. Cost of buying back land at Marylebone for further platforms estimated at >£700m, probably at last years prices if not before. This must also be one of the first Route Study’s to discount terminus platform lengthening as too far for travellers to walk ( as well as a few our reasons inc dirsuption etc). 1) Is there room without demolition and bridge rebuilds? 2) Are the Old Oak services diversions or extra services? 3) Why does one of the two aspirational services only go as far as Gerrard’s Cross? 4) Is this really a long term aspiration for 2tph Crossrail to High Wycombe? 5) Could the Crossrail trains by modified to run diesel like IEP? 5: Almost certainly not – where are you going to put the noisy smellies diesel engines & tanks? Maylebone station is, clearly, a problem which will only get worse. I’ve not been able to find a decent scaled plan, but could there be an option to add a ‘Platform 0’ by narrowing the existing 1-2? Despite the removal of the taxiway the present width looks very wide and, given there are no through trains speeding past, it might be possible to reduce the width (as has, in effect, been done at London Bridge)? Adding a further – long – platform would be a good result, surely. I cannot see any possibility whatsoever of trains with a diesel tank (full or empty) being allowed in the Crossrail tunnels during operational hours. And, once fully operational, only absolutely exceptionally during engineering hours. I suspect the problem is railways standards that mean that the columns supporting the roof have to be at least 2m from the platform edge. Just something to note – the ‘carriage road’ (as in horse and carriage, not railway carriage) at Marylebone is now occupied by platforms 2 and 3. It was removed back in NSE days allowing the 3rd span of the trainshed roof to be demolished and release the land closest to the concourse for the building of the hotel extension (the rest of the platform site became home to carriage sidings replacing those for north of Rossmore Road in the eastern side of the main line – the site of which is now ‘Palgrave Gardens’). Thus the original platforms 2 & 3 became 4 & the boundary wall. (Platform 4 subsequently shortened and the section nearest the concourse being filled in when Chiltern Railways opened platforms 5 & 6). However all this did not result in any reduction in the number of platforms – yes believe it or not Marylebone only ever had 4 platforms from the outset. The Great Central Railway Company did allow for future expansion (the station throat layout on old mapping quite clearly indicating that extra train shed spans and platforms were intended to the west). Unfortunately traffic was never busy enough to warrant it and the Victorian Terraced houses were left standing till after WW2 when the area was redeveloped with the concrete flats that now stand there. It is thus perhaps ironic that unlike most other stations over the years, Marylebone actually has more platforms now than it ever had when railways were at their peak. Page 80 for the £700m price tag. It doesn’t even earn an “Option Table”, can we work out what it would say? Is there a diagram of what Old Oak Common with Chiltern platforms would look like? It’s not in the route study. Presumably the line would cross Crossrail at some point to maintain access to Paddington. PoP 05/08 @ 21:25: I remember we had to get a derogation from that bit of the standard when reinstating the canopy on Horsted Keynes platform 1. The columns (which are bolted to the original 1882 foundations) are less than 2 metres from the platform edge — but more than 6 feet, which presumably was the standard in force when the original was built. See page 75 (half way down 2nd column). It clearly states that the 4 trains per hour to Old Oak Common would be extra services. Anyone know what OCC stands for? 16 in 1899, 21 in 1922, 24 today. You could add in the Necropolis station but then you’d also have to count the underground and Waterloo East. I suspect the inclusion of Stratford in this category is subject to including the underground. However, it is an interesting point to ponder. Stratford – and the DLR and London Overground. Also remember the LNER built Fenchurch Street bays though unused until DLR came along. But I don’t quite see what any count is trying to prove! @Jonathan Roberts – like you, I can’t see what platform counts prove. As your Fenchurch example illustrates, platform quantities are indicative of nothing, and in terms of capacity, station track layout is often the determining factor . Some of the busiest stations (Oxford Circus, Holborn) have very few platforms. And for the converse, I give you the stations produced by Gosplan – “a city of 800 000 people must have a station with 12 platforms” – of which the best example is Skopje, with, indeed 12 platforms; unfortunately, only six of them have track, although 8 are fully equipped with OHLE… Tallinn highly commended. It’s interesting that fewer platforms is good, and more platforms is good, but there’s a fetid hollow of inconvenience in the middle. Good – St James, where if you are on the wrong train you just get off and wait for the correct one. No walking required. Bad – Vauxhall, where more platforms means you have to make a choice between 3 platforms on 3 different islands to go to Waterloo, and if you get it wrong you are faced with the choice of trying to change platforms or staying to wait and see. A game with many wrong choices. Good – Waterloo, where many platforms allow trains to be advertised for boarding quite some time in advance, so you can take your time selecting a train and amble over to get a seat with no pressure or hurry. All trains to Waterloo go from platforms 3, 4 and 7, the former two of which are an island. Trains are frequent enough that even if you guess wrong a train will turn up in less time than it would take to walk to the other platform. If only……….. . In practice they keep you guessing until the train is entering the platform, leading to an unseemly scrum at the barrier as everyone tries to pile through at once – in both directions. @timbeau – indeed. Bob seems to use a different Waterloo to the rest of us. The Portsmouths are invariably shown no sooner than 5 minutes before departure. Couple that with “shut and go” at T-30 secs, and the love of top train working, leaves the unfortunate punters about 4 minutes to negotiate the barriers, walk 100 m, past the stabled oou set, and then try and find a reasonably empty coach. I hear the argument that platforming may be unpredictable but experience suggests that well over 90% of departures are from the scheduled platform; it would do no harm at all to show the scheduled platform within, say, 2 minutes of the stock arriving with the option of an override if it turns out to go somewhere else. After all, the signalling systems do know where the trains are and where they should be these days. There is an aeriel photo of Skopje Railway Station in the Wikipedia article about the city. It makes a nice Bus Station roof. 2 minutes before arrival is far too late – you would still get the barrier scrum. There is no good reason why the platform shouldn’t be displayed as soon as the previous train has vacated it, as is the norm at almost any other station. (Indeed, most stations show the next three trains on each platform, which on a 2tph route means up to 89 minutes ahead). In the rare event of a platform alteration being necessary after that point, having the passengers switch should be easier than now, because the concourse will not be rammed full of people waiting for their platforms to be announced. @Mike – the old one or the new one? One of the legacies of Tito’s attempts to modernise the city was to remove the railway station from the city centre, but without renaming “Railway Station Street” in which the old one had stood. You may imagine the struggles with cab drivers. @GH – The image on the Wikipedia page is of the ‘new’ through station at Skopje, which is above the large coach station. The old station was heavily damaged in the devastating 1960s earthquake, but what survives of the 1930s main building is now a museum dedicated to the event. I can’t tell whether the old station was through or terminal in configuration, but from the road layout it’s possible a complete cross city route was removed as part of the post earthquake reconstruction. @Mark Townend – thanks for that. I strongly suspect it was a through station – bits of the connecting lines remained in the city, reflected in the median strips of various dual carriageways.